homestay central kalimantan - Friends of Borneo. Keeping it wild! Sebangau National Park in Central Kalimantan is home to one of the biggest orangutans populations in a massive 500,000 hectare national park.It is one of the best locations to experience a Borneo peat forest setting. We are super excited to work with Sebangau National Park to bring you this opportunity to experience nature and local culture in a homestay setting! ​If this is your first visit to Indonesia, please start at the Indonesian Embassy website to confirm whether you will need a visa to enter the country. Passport holders from most countries can enter Indonesia without applying formally for a visa. For terms and conditions of visa free entry into Indonesia, please read the information on the webpage we linked above and note the categories of visitors that qualify for visa free entry AND your passport must be valid for a minimum of 6 months after entry date into Indonesia. There are different points of entry into Indonesia where visa free entry is facilitated. If you are coming from Kuching, Sarawak, then Pontianak( Supadio International Airport ) would be your point of entry to Indonesia. Direct flights from Pontianak( Supadio airport ) to Palangkaraya( Tjilik Riwut airport ) are limited so check airline schedules carefully to allow yourself adequate time to clear immigrations before boarding your flight to Palangkaraya. An alternate visa free entry point is of course Jakarta airport, Soekarno-Hatta International Airport. Direct flights from Jakarta to Palangkaraya are available. We strongly recommend you check Garuda Airlines for flights available. If you have other questions, please do not hesitate to email us. We'd be more than happy to help cos we want to see you in Sebangau National Park! Your adventure into one of Borneo's biggest protected peat forests comes with a complete service. From the time your hosts pick you up from your Palangkaraya hotel, all meals, park entrance fees and transportation is included. 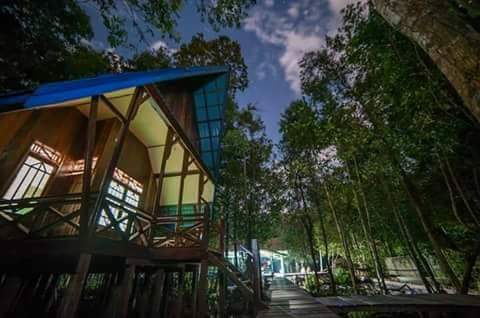 The photo to the right is your homestay which is located deep inside Sebangau National Park. This homestay is jointly managed by park authorities and the villagers from Keruing and Jahanjang who have benefitted from eco-tourism activites. per package due to travel restrictions. Your journey to this jungle homestay starts with a drive from Palangkaraya towards Keruing village where a boat will take you further into the park to Jahanjang village. Due to the limited space available in the car and boat, the packages are offered as one package for two guests. If there are more people in your group, additional packages will have to be purchased in increments of 2 persons per package. The photo to the right shows the secluded location of your homestay in Sebangau National Park. It doesn't get better than this for a wilderness experience. Day 1. Pick up from your hotel at 8.30 am and start a 3 hour drive towards Jahanjang village. Lunch will be served in the guesthouse. After lunch, go for a short boat trip in the lake to see various wildlife in the area. Return to the village area late afternoon to walk around the village area. Dinner will be served at the guest house where traditional Dayak dances are available upon request. Day 2. Breakfast at 8.00 am before taking a 40 minute boat ride to the jungle guesthouse. Jungle treks will be arranged to see wildlife including hornbills, endemic Borneo plant life etc. Wild orangutan sightings are not guaranteed and should be considered a bonus if they are seen. Dinner will be served at the guesthouse. After dinner, a short night trek can be arranged or you can choose to simply enjoy the wild atmosphere at night. Day 3. Breakfast at 8.00 am before your guides take you to explore different areas of this unique Borneo wilderness. Do let your guide know your preferences whether its to simply relax and take in the environment or to return to previously explored areas. Day 4. Breakfast at 8 am before preparing to return to Palangkaraya where you will be dropped off to your hotel. Please note this is an extremely wild area. Please observe all park regulations for a safe visit and remember to keep your flotation device on when travelling by boat. Please ensure you have purchased travel and medical insurance in the event of accidents and that your insurance provider is aware that you will be in wild locations in Borneo. By booking your wildnerness experience, you acknowledge that you are fully aware of the dangers associated with visiting a wild, watered area in Indonesia and that you and your friends are wholly and absolutely responsible for your own health and safety.